Fall may come late to Texas, but Spring typically arrives early and we are thrilled with the warmer temperatures and blue skies! My husband and I have just returned from our semi-annual trip to Lubbock to visit our daughter. After a fabulous visit with her sweet family, we headed over to Boerne, in the Texas Hill Country, to see my brother-in-law and his lovely wife. After what seemed like a rather frigid winter, ( at least for Southeast Texas ) it was perfect time of year to schedule a little getaway and enjoy the warming temperatures. The drive through central Texas was fabulous with rolling hills and so green after all the rains. 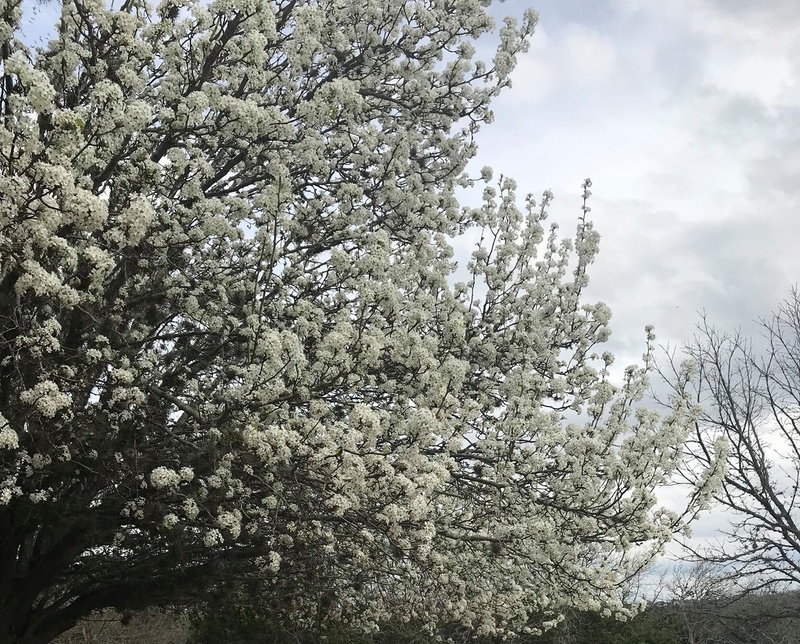 Although the trees were still mostly bare and brown, there were some Flowering Pear and Redbud trees scattered along the roadside that signify in Texas that Spring is truly on it’s way! Visiting the Texas Hill Country is always a delight for me. I have been captivated by it’s rustic beauty ever since I was young and I always look forward to returning for a visit. The rugged, rolling hills covered with live oak and cedar trees never fail to soothe my soul and allow me to wallow in the joys of nature. 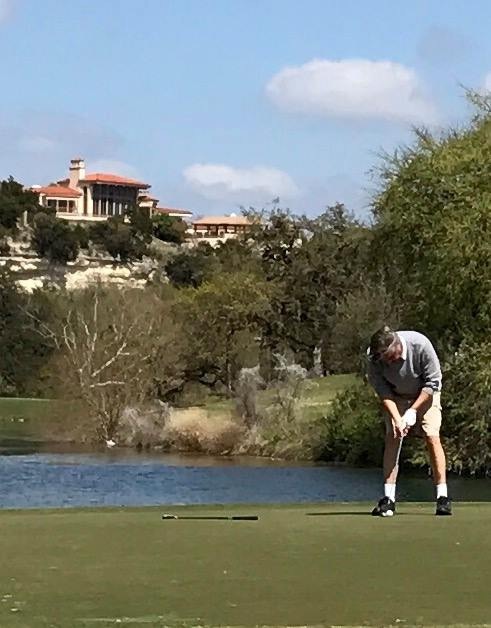 Of course, while visiting in Boerne, my husband had to play a round of golf at the amazing Tapatio Springs Golf Course. 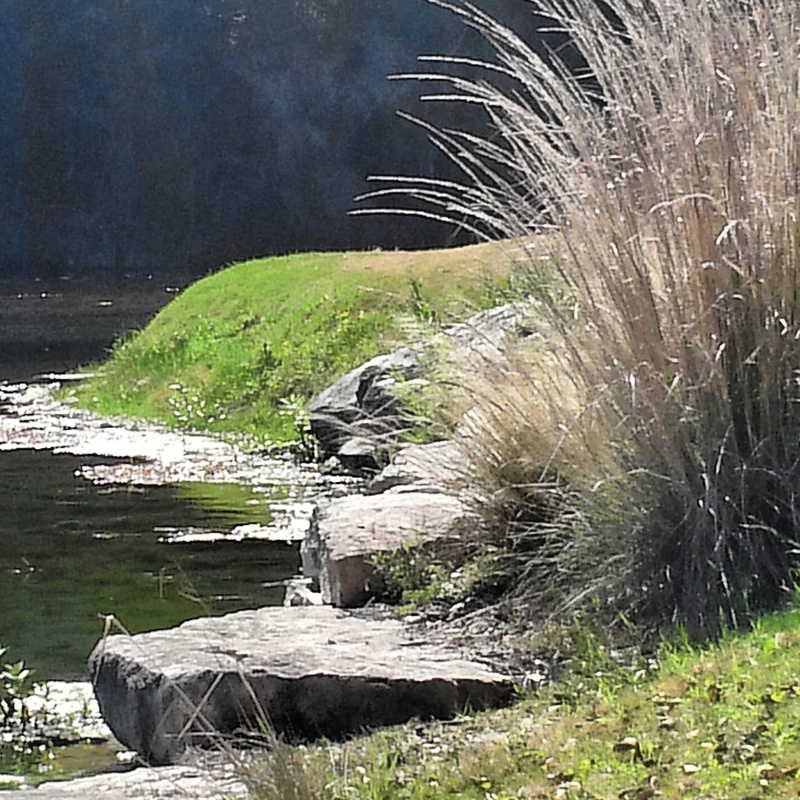 Tapatio Springs is on 220 acres in the heart of the hill country. Several years ago an investment group which includes country music star George Strait purchased the resort community and have been making improvements on the property ever since. You can read more about Tapatio Springs here. Sadly, the newly renovated club house burned to the ground in early November, but the golf course and other facilities are open and they will be rebuilding the club house in time. Although I’m not much of a golfer, I do enjoy riding in the cart and taking in the beauty of Tapatio Springs. I always take my camera along with me so I can snap a few shots of the lovely golf course and the amazing homes surrounding it. View from the golf course of Tapatio Springs. A visit to the Texas Hill Country never disappoints me. There is so much to see and do in this region of the country. The Hill Country has something for everyone from antiquing in one of the charming towns such as Fredericksburg, to enjoying the music scene in Austin, or taking in the beauty of one of the many rivers that meanders through the rustic, rolling hills such as the Guadelupe or the Comal. As always with out visits to the Hill Country, too soon it was time to make out way back to our home in Cypress, but I look forward to another visit to the amazing Texas Hill Country soon! August is upon us, often known as the dog days of summer. In the southern United Stares, August can be uncomfortably warm with relentless heat and humidity. Southerners are growing ever so tired of the heat and yearning for the slightly cooler temperatures of fall. The best place to spend these warm summer days is at the beach or the lake…. or at least in a cool refreshing swimming pool. Another option is to visit one of the many rivers that wind through the Texas Hill Country. The water can be quite chilly and many rivers offer the cool relief of tubing or rafting. 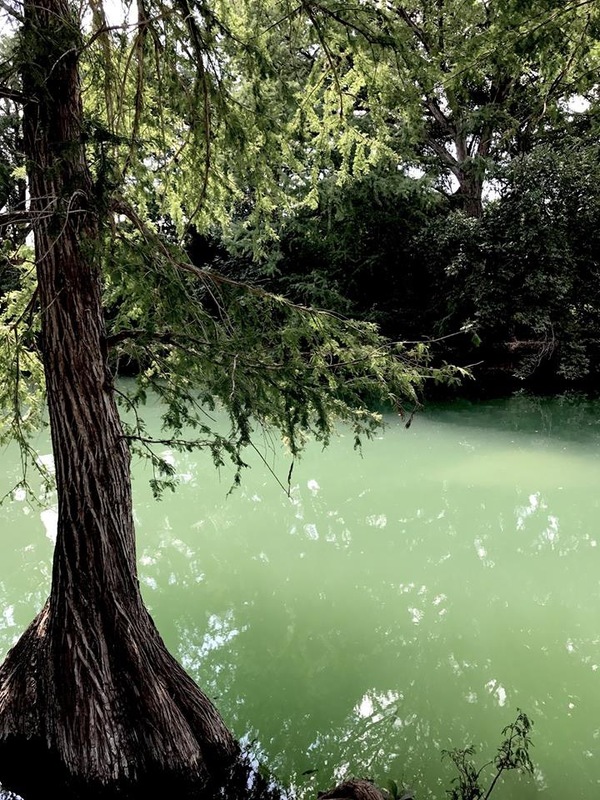 While we didn’t get away to the beach or lake last weekend, we did stumble across this pretty spot on the Medina River near Bandera. It was peaceful and quiet, the perfect spot to take a moment to relax and take in the quiet beauty of the river banks. Huge Cypress trees lined the banks offering plenty of shade from the hot Texas sun. Actually, we were quite lucky that the recent rains had brought cooler temperatures, a huge improvement to the mid nineties of most August days. I couldn’t get over the amount of birds that were wondering the banks and frolicking in the water. I did a little research and to the best of my knowledge they were Graylag and Swan Geese with a few Muscovy Ducks mixed in. (Thank you RH for your assistance on this!) I went crazy trying to capture as many photos as I could of these amazing creatures. We came to the river after having a late breakfast in Bandera, also known as the “Cowboy Capital of the World.” Why it’s called that I’m not really sure, but I did find some hard to resist western boots in one of the local shops. Another interesting tidbit about Bandera is that Paris Hilton and Nicole Richie visited Bandera while taping their reality show The Simple Life. If you happen to be a country music fan, Bandera was once called home to country musician Robert Earl Keen. We stopped for breadfast at the OST Restaurant in downtown Bandera. O.S.T. stands for Old Spanish Trail, a route that was designated to improve highway access back in 1915. The OST Restaurant opened in 1921 and today is one of the last original restaurants along the route. It features a John Wayne room which features, of course, a plethora of John Wayne memorabilia. No trip to Bandera is complete without visiting the General Store. If you want to experience a bit of Texas history, this is the place to be. The store is filled with local treasures and there is even an authentic 1950’s ice cream fountain. we did not sample the ice cream as we had just finished breakfast, but I’m sure it would be a delight! Overall, I really enjoyed out quick trip to Bandera, Texas and the Medina River. Bandera is filled with a rich Texas history and left me with a desire to return and explore a little more. As they say in Bandera….. If you are a lover of rustic charm found in nature, the Texas Hill Country is the place to go. A few years ago my brother-in-law and his lovely wife moved into the exquisite resort community of Tapatio Springs. This was a double blessing for my husband and me because not only do we get to visit with them more often, it gives us more opportunity to explore one of our favorite regions in Texas. Tapatio Springs hosts the perfect mix of Texas nature with deluxe resort. 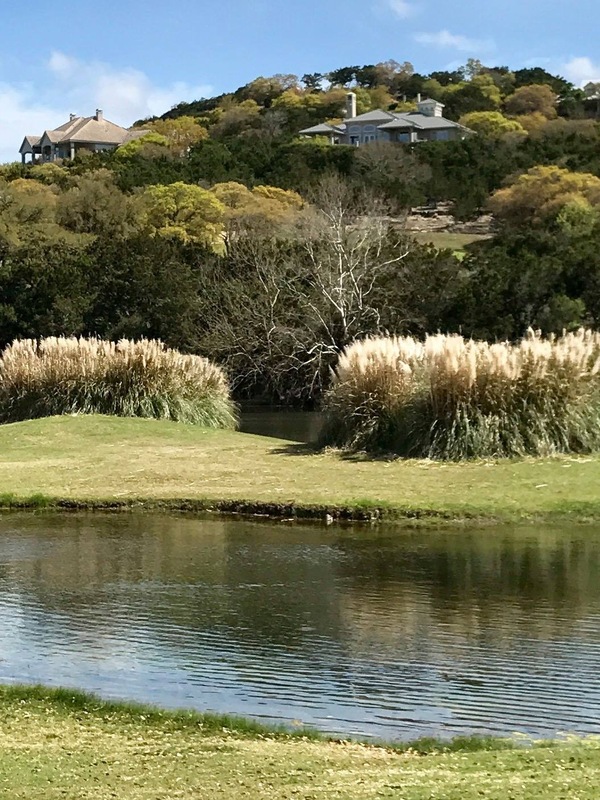 This awe inspiring golfing community is nestled in the heart of the hill country, just outside the charming town of Boerne. I have to tell you the brief ten minute drive on Johns Road from I-10 to get to Tapatio Springs is just as sweet and charming as the lovely community itself. Once you exit I-10, the road twists and winds through the rustic and hilly countryside that gives the area it’s name. As you drive be sure to keep your eyes open for deer, sheep, goats and various other wildlife you might see as you drive. As you take one last turn around the bend at the top of the hill you get your first breathtaking view of Tapatio Springs. The resort was bought several years ago by the country/western singer George Strait and a group of investors and they have been making improvements to the resort ever since. 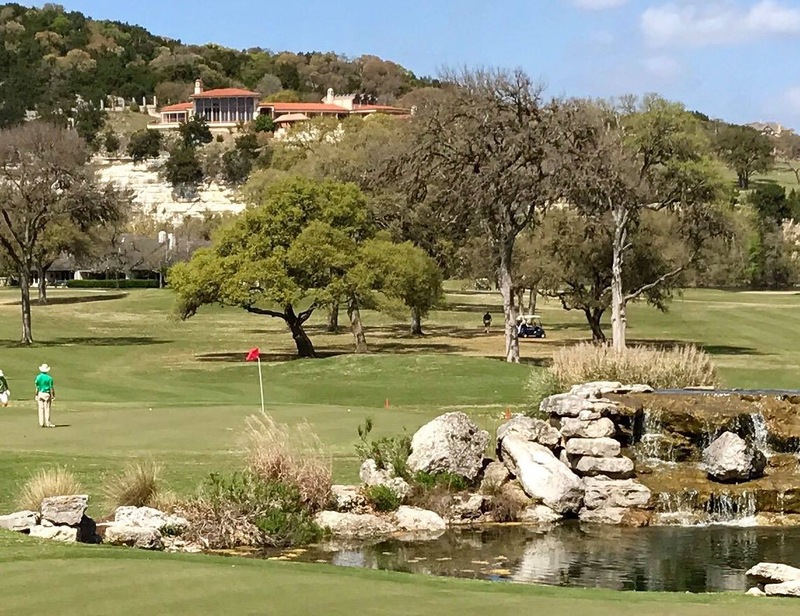 The 18 hole golf course has recently been renovated by architect Tripp Davis and Associates and features an amazing panoramic view of the rolling Texas hills that surround the golf course. I’m honestly not much of a golfer, but I do enjoy riding in the cart and taking in the beauty of the surroundings. 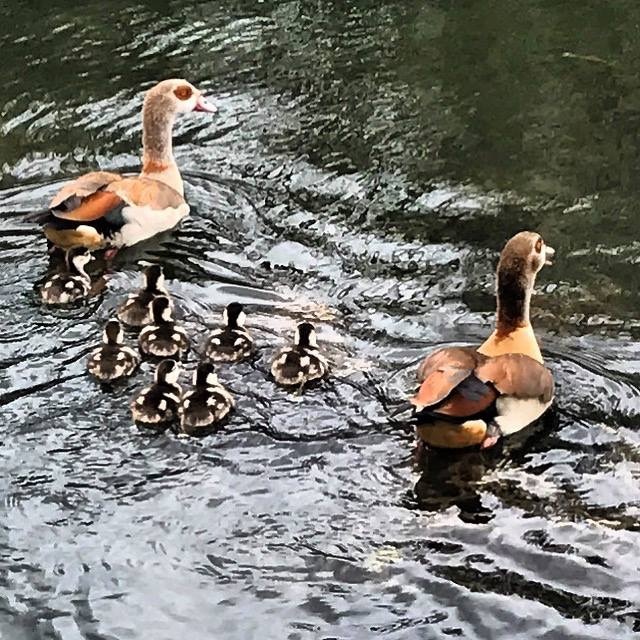 I also enjoy photography so this seemed the perfect opportunity to practice my amateur photography skills while Dear Husband practiced his amateur golfing skills. As you tour the golf course, you get an amazing view of not only some of the highest hills of the area, but also some of the beautiful homes surrounding the golf course. 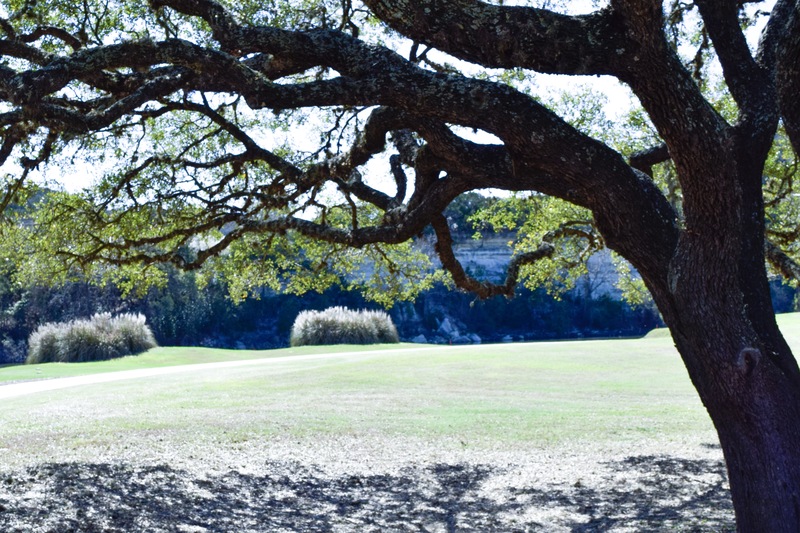 The 18 hole golf course offers a spectacular venue and is filled with auspicious live oak trees, rolling terrain and abundant with water features. 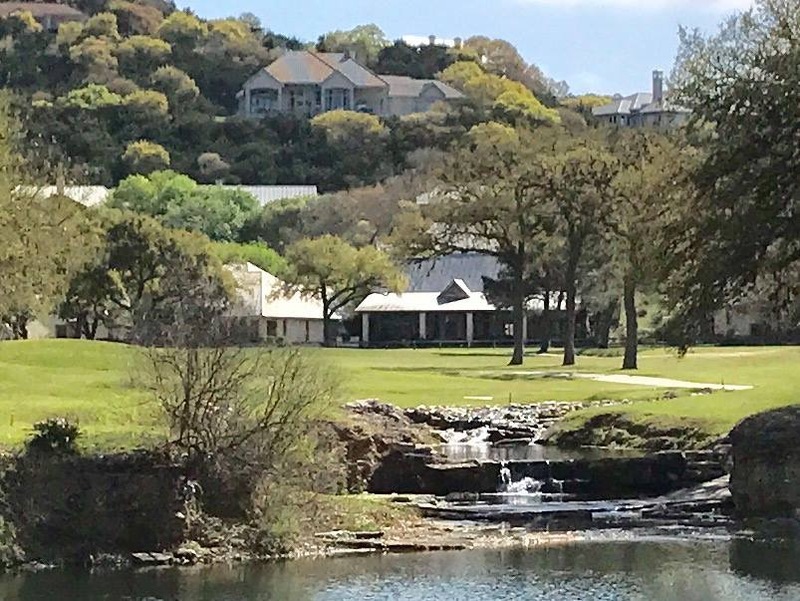 This serene Hill Country Resort offers both a photographers and a golfers delight! As always, when it’s time to pack up and return to our busy lives in the city, I’m thankful for the opportunity to have spent some relaxed time in the serene beauty of the Texas Hill Country! I know that there are many places of awe inspiring beauty in the world. Colorado has the most majestic mountains I’ve ever seen. I am enthralled by the crystal clear waters of the Caribbean Sea. I have been astounded by the breathtaking beauty of Hawaii. Thailand fascinated me with it’s exotic culture and charming people. I long to visit and see more of these amazing places. However unique and fascinating those places are, they are far from my home. So, when I need a quick getaway from the hustle and bustle of the city, I escape to the Texas Hill Country. My husband and I load up the Tahoe, along with our schnauzer, Bear, and head west until the flat lands gradually turn into rugged, rolling hills covered with live oak and cedar trees. Nestled between San Antonio and Austin and encompassing 25 counties, the Texas Hill Country boasts of a rustic charm filled with a a rich Texas history, charming architecture, and a natural beauty that soothes my soul and brings me peace and serenity. I have to admit, the weather was less than desirable the weekend of our last visit. After our arrival the fog and rain set in, and temperatures dropped into the 30’s. No worries though. We loved being there no matter what the weather. The Texas Hill Country is known for it’s numerous small town venues, restaurants and antique shops all filled with quaint, rustic charm. One of our favorite hidden gems is the Welfare Cafe. Located off IH-10, between Boerne and Comfort, the Welfare Cafe is an out of the way kind of place that is not too be missed. The Welfare Cafe began as a General Store way back in early Texas history opening around 1848. The local post office was later established in 1880 inside the General Store. Welfare became a railroad shipping point and the small town thrived. By 1892, the town of Welfare consisted of a whopping 275 residents, along with a schoolhouse, saloon, hotel and cotton gin. In 1916, the original general store and post office burned down, but was rebuilt that same year. As time passed, the small towns population dwindled and bad times haunted the small community. The boll weevils destroyed the cotton crops, and of course there was the great depression. The population dropped to a mere 25 residents. Through it all, the post office and general store continued to be an important meeting place for the community. A place to collect your mail and exchange stories, borrow books and talk about the weather. Over time as the population of the small town dwindled, the local school closed and the few students that still lived in Welfare would take the bus to the school in Comfort. At the end of the day the bus would drop them off at, where else, but the general store. In 1966, the trained stopped running past Welfare and it wasn’t long after that the post office closed, followed by the general store in 1978. Today, the fascinating history of the small community of Welfare is being revitalized by Gabriele McCormick and her husband David. In the early nineties, Gabriele and David were looking for a change from corporate life in the city and fell in love with the charm of the hill country, as so many of us do. They purchased the general store, post office, and various barns on about 150 acres. Slowly, they began to restore the old buildings and began the transformation to what we now enjoy as the Welfare Cafe. The restaurant has thrived, and over the years, Gabby and David have continued to make improvements on the land. In 2005, the Goat Barn was built using reclaimed wood from the original barn. There is now an intimate wine bar in the loft. The Welfare Cafe frequently offers special events and is the perfect venue for a rustic, but charming hill country wedding. As mentioned previously, the weather was dreary the day we visited and the charming, rustic gardens were showing the effects of the recent freeze. I have to admit, I enjoy wandering the grounds almost as much as I enjoy the fabulous cuisine which has a touch of German influence. The day we were there, we enjoyed a delicious Sunday brunch complete with German sausage and strudel, croissants, an assortment of fresh fruits and cheeses, quiche, pancakes and so much more. Of course, what Sunday brunch is not complete without Mimosas! The Welfare Cafe is a delightfully charming venue filled with nostalgia and relics from the past. This is a delightful spot for a lovely lunch or dinner. Be sure to check out their website and calendar for special events. They offer special holiday celebrations and often have live entertainment. The charms of the Texas Hill Country are endless. If I had my way, I would spend my days wandering the many small towns and visiting all the lovely shops, restaurants, historical sites, and possibly a winery or two. I hope that someday you have a chance to visit the Texas Hill Country and explore the many fascinating venues that the area has to offer. * I would love to hear a comment from you have visited or plan to visit the Texas Hill Country or the Welfare Cafe and Goat Barn.